I have some exciting news to share today. I have a class coming soon to Big Picture Classes. 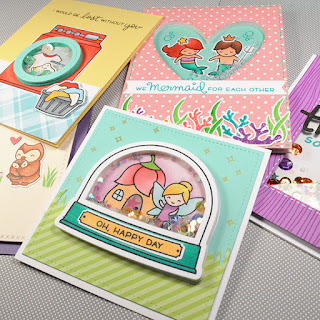 Get Shakin' with Lawn Fawn is a fun class focusing on shaker cards and using cute Lawn Fawn products. I will go through the basics of creating shaker cards as well as how to take those techniques and expand upon them. This class is great for those who have not yet tried the shaker card experience as well as those who might be more familiar with the techniques. I designed the class to start with the basics, including showing how different materials and methods that can be used. Then we will take those basics to the next level with tips for making unique cards and shakers using your favorite dies and stamps. This is the first full class I have done so I really hope you will join me. Class starts June 27th! Also starting June 27th at Big Picture Classes is another class with my friend Jenn Shurkus, Distress Ink Card Techniques which also features Lawn Fawn products paired with Distress Inks! I'm looking forward to her class as well. I love using distress inks but I know I could expand on my techniques and Jenn is really great with that. You can see more about her class HERE on her blog as well. My class is taught by video tutorials. Overall teachers are given their preference when they do a class at Big Picture Classes so it is all dependent on the teacher. No idea how to do these - I guess I need your class!